90% of retail today in the US is done in store but 80% of those customers pass through your website before they come in. Are you putting your best foot forward? Are the visitors to your website having a pleasant experience? Are you following website best practices? A website is never done. It is important to be continuously updating and improving your website. Your customers can tell if your site has been the same stale site for 3 years and so can search engines. Did you know that Google ranks websites that are regularly updated higher? What other best practices could you benefit from learning? 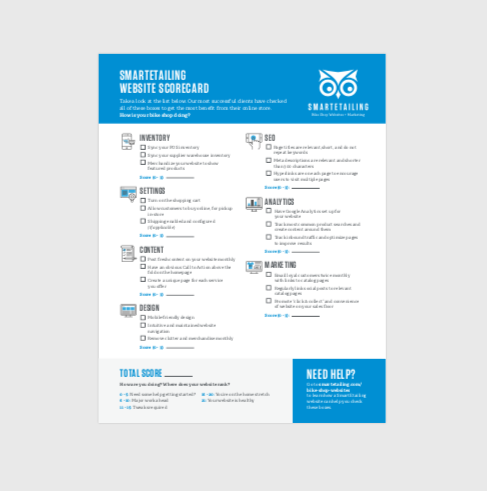 Complete this form to download the SmartEtailing Website Scorecard. See how your current website ranks using our handy website scorecard.